TargetOne is a retail management system that provides analytics-powered and personalized marketing solutions for multi-channel retail businesses and e-commerce providers. The platform enables effective, targeted campaigns based on insightful analysis across multiple digital channels. Users are able to track and measure the performance of each channel, tactic, campaign and asset. TargetOne’s omni-channel targeting allows organizations to execute personalized promotions and campaigns across email, SMS, and mobile apps. The solution helps ensure consistency across all channels by enabling event-triggered and scheduled campaigns. Users can centrally manage and control communication frequency, including subscription touch history, channel preferences, and unsubscribes. Customer lifecycle insights help organizations identify opportunities, while channel insights allow users to measure and track responses and engagement. TargetOne’s personalized recommendations come from an ensemble of algorithms, or data mining models, that help organizations adapt the most effective marketing approach. Personalization tactics include item cross-sells, top selling items, similar items, and items frequently bought together. A/B testing helps identify the most effective methods of communication for different segments, including automated test execution and winner identification. Micro-segmentation features enable organizations to create target segments based on customer profile attributes, transaction behavior, and more. TargetOne’s intuitive user interface allows for merging and de-duplicating of multiple segments. Users are able to monitor signals coming from channels like mobile apps and point of sale systems, to present appropriate offers in real time. Users can define rules based on online store basket context or customer interaction to sway customer purchase behavior. There are currently no reviews of TargetOne. Contact Manthan Systems for detailed pricing. Customer relationship managers and marketers can personalize promotions using TargetOne's analytically-driven recommendation engine. 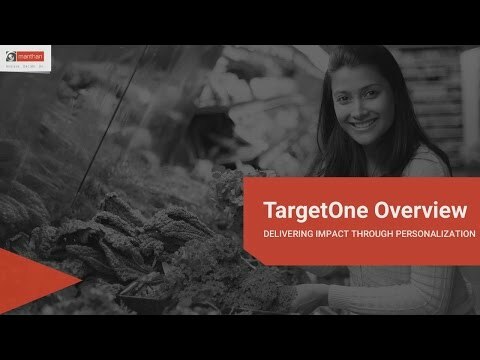 TargetOne's channel insights help track channel engagement and responses, while enabling organizations to understand the impact of each channel. Users are able to execute personalized promotions for highly targeted customers using TargetOne's predictive analytics. Lifecycle insights enable organizations to identify opportunities for customer reactivation, basket size improvement, trip frequency, and more. TargetOne provides users with pre-built connectors and defined processes that drive faster self service data loading. Below are some frequently asked questions for TargetOne. Q. What type of pricing plans does TargetOne offer? Q. Who are the typical users of TargetOne? Q. What languages does TargetOne support? Q. Does TargetOne support mobile devices? Q. Does TargetOne offer an API? No, TargetOne does not have an API available. Q. What other apps does TargetOne integrate with? Q. What level of support does TargetOne offer?